God Is Not Great: How Religion Poisons Everything (2007) is a book-length critique of religion by author and journalist Christopher Hitchens. It was published in the United Kingdom as God Is Not Great: The Case Against Religion. Atlantic Books, 2007-05-10. Export ed. Paperback. Used:Good. New York, Boston: Twelve, 2007. FIRST EDITION, first printing. Original yellow hardcover with yellow dust jacket. Jacket is slightly ruffled. Previous owner's name and date on the front endpaper. Overall a VERY GOOD book in a VERY GOOD brodart protected dust jacket.. First Edition. Hard Cover. Near Fine/Very Good. 8vo - over 7¾" - 9¾" tall. Hardcover. 2009-09-09. New. Ships with Tracking Number! INTERNATIONAL WORLDWIDE Shipping available. Buy with confidence, excellent customer service! New York, New York: Twelve / Hachette Book Group, 2007. Hint of rub to lower edges of boards and tail of spine. No prev. owner name. DJ with sunned spine panel, crease on front panel and on spine panel, and sligyht rubs to corners and ends of spine panel; price corner intact. Finalist for the 2007 National Book Award for Nonfiction. Incl. References and Index. 307 pp.. First Edition, 1st Printing. Hard Cover. Near Fine/Very Good. New York, NY: Twelve. NF/NF; Hardback in Near Fine condition with Near Fine dust jacket.. 2007. 1st Edition; 1st Printing. Hardcover. 0446579807 . 8vo 8" - 9" tall; 307 pages . Condition: NF/NF; Hardback in Near Fine condition with Near Fine dust jacket. 2007-05-07. Good. Ships with Tracking Number! INTERNATIONAL WORLDWIDE Shipping available. May not contain Access Codes or Supplements. May be ex-library. Shipping & Handling by region. Buy with confidence, excellent customer service! 2007-05-10. Good. Ships with Tracking Number! INTERNATIONAL WORLDWIDE Shipping available. May not contain Access Codes or Supplements. May be ex-library. Shipping & Handling by region. Buy with confidence, excellent customer service! Twelve Books, 2007-05-01. Hardcover. Used:Good. Toronto, ON, Canada: McClelland & Stewart, 2008. Soft cover. Very Good. 8vo - over 7 in- 9 in Tall. Soft cover.Very good . 307 pages.Hitchens, one of our great political pugilists, delivers the best of the recent rash of atheist manifestos. The same contrarian spirit that makes him delightful reading as a political commentator, even (or especially) when he's completely wrong, makes him an entertaining huckster prosecutor once he has God placed in the dock. And can he turn a phrase! : "monotheistic religion is a plagiarism of a plagiarism of a hearsay of a hearsay, of an illusion of an illusion, extending all the way back to a fabrication of a few nonevents." Hitchens's one-liners bear the marks of considerable sparring practice with believers. Yet few believers will recognize themselves as Hitchens associates all of them for all time with the worst of history's theocratic and inquisitional moments. All the same, this is salutary reading as a means of culling believers' weaker arguments: that faith offers comfort (false comfort is none at all), or has provided a historical hedge against fascism (it mostly hasn't), or that "Eastern" religions are better (nope). The book's real strength is Hitchens's on-the-ground glimpses of religion's worst face in various war zones and isolated despotic regimes. But its weakness is its almost fanatical insistence that religion poisons "everything," which tips over into barely disguised misanthropy. (May 30) Copyright © Reed Business Information, a division of Reed Elsevier Inc. All rights reserved. Twelve, 2009-04-06. Lrg. Paperback. Used:Good. 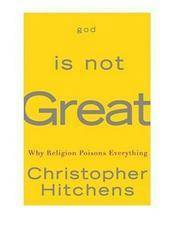 Christopher Hitchens - God Is Not Great - Paperback. Book. BRAND NEW. A&U, 2007-01-01. Paperback. Like New. Ships Out Tomorrow! Hachette Book Group USA, 2008-01-01. Mass Market Paperback. Used:Good. New York, New York, U.S.A.: Twelve, 2007 Christopher Hitchens, described in the London Observer as "one of the most prolific, as well as brilliant, journalists of our time "takes on his biggest subject yet the increasingly dangerous role of religion in the world.With his unique brand of erudition and wit, Hitchens describes the ways in which religion is man-made. "God did not make us," he says. "We made God." He explains the ways in which religion is immoral: We damage our children by indoctrinating them. It is a cause of sexual repression, violence, and ignorance. It is a distortion of our origins and the cosmos. In the place of religion, Hitchens offers the promise of a new enlightenment through science and reason, a realm in which hope and wonder can be found through a strand of DNA or a gaze through the Hubble Telescope. As Hitchens sees it, you needn't get the blues once you discover the heavens are empty. National Book award sticker on dj. Remainder mark, else near fine. Reprint. Hard Cover. Very Good/Very Good. New York & Boston: Twelve (Hachette Book Group USA), 2007. WYSIWYG pricing--no added shipping charge for standard shipping within USA. White boards, foil titles on spine, [x], 307,  pp, notes, index. Spine slightly cocked. DJ has 2-inch sticker scar on front panel; in Brodart archival cover. Shipping weight 2 lbs. (International 1 lb., 12 oz.). 9th ptg. . VG+/VG. 23½ X 16 cm. McClelland & Stewart, 2007. Pages: 307; Weight: 14.6oz; Size: 9.1" x 6.3" x 0.9". Minor rubbing and edgewear and 2 tiny corner creaseson cover, otherwise clean, unmarked, tight.. Very Good. Soft Cover. . . .
NEW YORK: TWELVE/HACHETTE. VG/VG- LIGHT EDGEWEAR AT HEEL. LIGHT STAIN TO DJ FRONT. Pages: 307. . 2007. LATER PRINTING. HARDCOVER.. TEXT CLEAN, BINDING TIGHT. . Condition: VG/VG- LIGHT EDGEWEAR AT HEEL. LIGHT STAIN TO DJ FRONT. Pages: 307. God Is Not Great; How Religion Poisons Everything. Twelve. Religion & Spirituality. New. Brand New: This item is brand new unopened, never used and still in its original manufacturer condition. Twelve. Hardcover. B00342VGEK Like New. Clean, Tight and Neat. Five star seller - Buy with confidence! . Fine. Atlantic Books, 2007-05-10. Paperback. Good. Twelve. PAPERBACK. 0446697966 New book. . New. 2009. Twelve. PAPERBACK. 0446697966 Special order direct from the distributor . New. New York: Twelve, 2007. 307pp. Extremities lightly rubbed. Dj extremities lightly rubbed & soiled. References & index.. Hb. VG/VG-. Emblem Editions, 2008. Pages: 307; Weight: 13.9oz; Size: 9.1" x 6.3" x 0.9". Minor edgewear on cover, front cover has a slight curl, name on flyleaf, otherwise clean, unmarked, tight. . Very Good. Soft Cover. . . .
Atlantic Books. Used - Very Good. Great condition for a used book! Minimal wear. Twelve. PAPERBACK. 0446697966 BRAND NEW, GIFT QUALITY! NOT OVERSTOCKS OR MARKED UP REMAINDERS! DIRECT FROM THE PUBLISHER!|0.6 . New. New York: Twelve, 2007. 307pp. Index. Wear boards, soiling, fading, DJ: soiling, scuffing, extensive wear extremities.. Hb. G+/G. Emblem Editions. Paperback. 0771041438 . Very Good. 2008. Emblem Editions. Paperback. 0771041438 . Fair. 2008. Emblem Editions, 2008-09-01. Paperback. New. GREAT Bargain Book Deal - some may have small remainder mark - Ships out by NEXT Business Day - 100% Satisfaction Guarantee! Twelve. PAPERBACK. 0446697966 Outstanding Condition! All pages/text and binding are excellent, clean, tight. Shows very minor use. Buy with confidence ....Customer Service is our TOP PRIORITY ! Delivery confirmation on all orders. . Fine. London: Promis Books Limited, 1988. Hardcover with dust jacket, 182 pages, minor shelf/edge wear. . Hard Cover. Good/Good. 8vo - over 7¾" - 9¾" Tall..
New York: Twelve Books, . Hardcover. Very Good in wrinkled dust jacket; top and bottom of spine bumped; previous owner's name on first free endpaper.. 6.2 x 1.2 x 9.2 inches. Eighth Printing Hitchen's insightful takedown of religion; always entertaining. Condition: Very Good in wrinkled dust jacket; top and bottom of spine bumped; previous owner's name on first free endpaper. Twelve, 2009-04-06. Paperback. Like New. Book has slight shelf wear from storage and use; otherwise the book is in excellent condition. Twelve Books, Hachette Book Group, 2007-05-01. Hardcover. Good. Twelve, 2009-01-01. Paperback. New. GREAT Bargain Book Deal - some may have small remainder mark - Ships out by NEXT Business Day - 100% Satisfaction Guarantee! Emblem Editions, 2008-09-02. Paperback. Good. NY: Twelve Books (Hachette Book Group), 2007. Book. As New. 305 pp. As new. Hitchens relates his own experiences with religion and how he came to a deep belief in atheism and a scientific view of reality. Size: 8vo -- 9.5 In. Twelve. PAPERBACK. 0446697966 Contents are tight and clean . Very Good. Twelve Books, Hachette Book Group. Very Good+ in Very Good+ dust jacket. 2007. Later Printing. hardcover. 0446579807 . Tiny stains on front endpaper; 1.1 x 9.1 x 6.1 Inches; 307 pages .